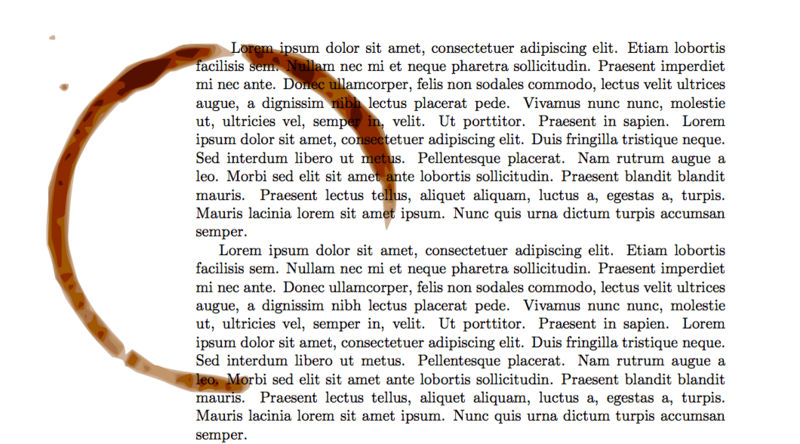 Probably not for your thesis, but nevertheless worth checking out: Hanno Rein wrote the LaTeX Coffee Stains package which adds beautiful coffee stains to documents. I had to typeset the document twice for the stains to appear. Also, drawing the stains may take a few seconds. Check out the website for more details and the latest version of the package. The version used to generate the examples above can be downloaded here (coffee4). Coffee4 works with pdfLaTeX and provides more flexibility in terms of size of the stains and placement. That’s really great for a little fun with LaTeX. Why can’t the Tex Live Utility find the package coffee4? I totally agree. The package is not (yet) part of the main distribution. But you can always manually install additional packages. as for the package, if it’s on ctan and released under a free software license, it’ll make its way into TL in another week or two, after the release freeze is over. Thanks for the link and the clarification. Best, tom.
! Illegal unit of measure (pt inserted). I use TexShop on Mac OS X. It would help if you provided a few lines of code to illustrated what you are doing and for me to reproduce the issue. Thanks, Tom. You are right, thanks for pointing this out. Here is an example where the stains coincide after rotation and translation in different directions.